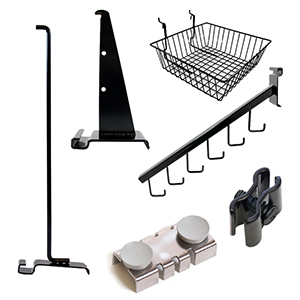 Although there are countless accessories you can use for Gridwall, the most popular Gridwall Accessories that we offer are Brackets, Hooks, Faceouts & Waterfalls, Shelves & Baskets. All of our Accessories come in 3 colors: black, chrome & white. At American Retail Supply we offer Gridwall Brackets in multiple different sizes: 4, 6, 8, 10, 12, 14 &16 inches. These sizes are based on how far the brackets stick outward and are made to accommodate as much space as needed. Slide and clip the brackets onto any Gridwall or Slatgrid and place your shelves onto the bracket to create an instant shelf. Our Gridwall Hooks are available in multiple different unique shapes and sizes depending on what you are using each hook for. Gridwall Hooks range in length between 1 to 12 inches long and are available in different thickness depending on the hook. We offer regular duty hooks, which are 3/16 inch in thickness, to heavy duty hooks that are ¼ inches thick. These accessories feature a 45-degree, or 90-degree angle hooked end. The angle of the hooked end becomes important depending on what you are hanging on each hook. If you want to be able to remove something from a hook with ease, the 45-degree hook is more ideal compared to the 90-degree. We also offer 2 different options of Slatgrid Hooks. While most Gridwalll Accessories will also work with Slatgrid, these hooks are made specially to fit the Slatgrid’’s wire pattern. We offer 3in or 4in, black Slatgrid Hooks. Slatgrid Hooks have a “L” design and can rotate 90 degrees to the left. Apparel, Hardware, Gift Shops and more will love the flexibility that Faceout and Waterfalls will give them. From hangers, shopping bags, shovels, and other accessories these Gridwall Accessories can display them with ease and style. Gridwall Faceouts stick out straight from the Gridwall Panel. Items displayed on the Faceouts are on the same height in comparison to the slanted nature of the Waterfall system. Gridwall Waterfalls are fashioned with two different end options; ball or hooks. Ball fashioned Waterfalls face upwards, whereas Hooked Waterfalls are downward. The ball and hook displays allow you to utilize the entire rod system without having products overlap. We currently offer both Faceouts & Waterfall accessories in 12 or 16 inches and in all 3 color options. Shelves & Baskets can be essential tools to utilize extra space on your Gridwall. At American Retail Supply, we offer a wide range of both products in black, white & chrome. Shelves & Baskets are perfect for gift shops, book stores, tradeshows and any place looking to display their items in an effective way. When it comes to shelving, we offer 2 main shelving styles; slanted and flat. Depending on the products you are displaying will determine which shelf style to go with. We also offer shelves with and without a lip. The current sizes we have available are 15x24 or 24x24. Our Gridwall Wire Baskets are great for holding medium to smaller sized products inside. Baskets are available in all 3 color options and in 2 different size options; 12x12x4 or 24x12x4. These baskets are great for small knickknacks, hats, postcards and more! They are also a great tool to use to increase impulse buying!